One of the most beautiful monuments in St George’s Chapel is that commemorating George Manners, 11th Lord Roos, and his wife, Anne. George Manners of Belvoir and Helmsley was the son and heir of Robert Manners of Etal in Northumberland and was born about 1470. The Rutland Chapel, as it is now called after George Manners’s descendants, was originally the chantry chapel of Anne’s parents, Sir Thomas St Leger and his wife Anne, Duchess of Exeter. There is a beautiful memorial brass to them on the east wall of the chantry chapel that was founded for them in 1491. 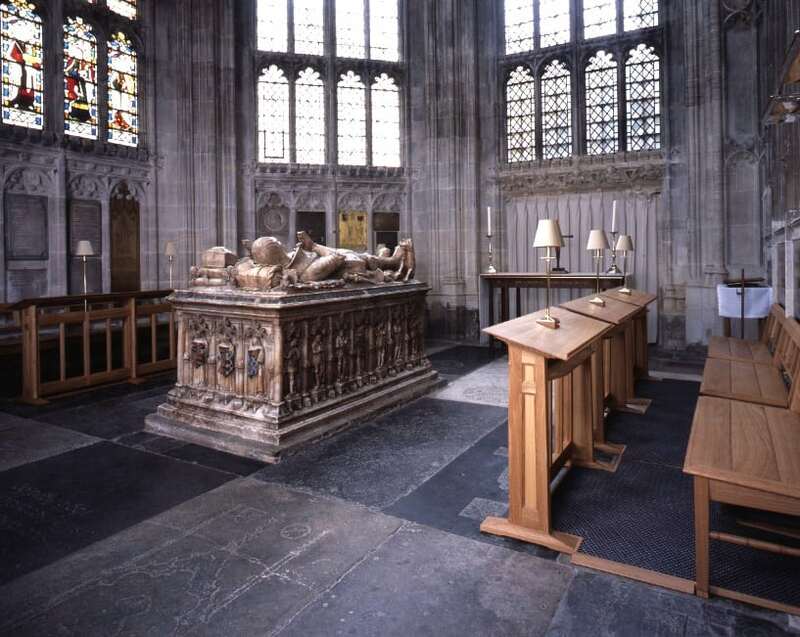 The tomb of George and Anne Manners is a prominent feature of the Rutland Chantry Chapel and their two recumbent effigies lie on top of the tomb. The knight’s figure wears full plated armour with flowers on the elbow pieces. His cuirass is high about his neck, and a long collar of SS, a common sign of high rank in Henry VII’s reign, is sewn on a band with a large rose pendant hanging from it. Under his head is a large helm crested with a peacock and a lively unicorn is shown at his feet. The effigy of the lady wears a partlet and a long gown with fluted sleeves frilled at the wrists. A little apron is slung from a richly embroidered belt and over all is a mantle. On her head she wears an angular lappet head-dress with extremely elaborate and delicate decoration and round her neck she has a triple chain with pendant cross. By her feet is a little dog – a sign of faithfulness with a collar of bells. Both effigies are beautifully carved in English alabaster. Around the sides of the tomb is a series of figures known as ‘weepers’ bearing shields of arms. Next PostNext No more beavers!